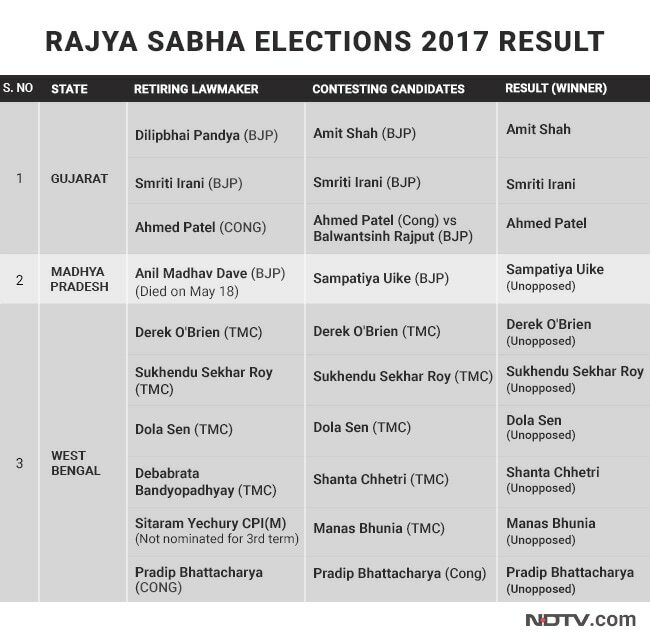 Ahmedabad/New Delhi: Congress leader Ahmed Patel is returning to the Rajya Sabha from Gujarat for a fifth term, winning the third seat today in a bitterly fought election that became a massive prestige battle between the Congress and the BJP. The other two seats have been won easily by BJP chief Amit Shah, who makes his debut in Parliament, and union minister Smriti Irani. For the Congress, snatching the Ahmed Patel win from a BJP determined to prevent it is the biggest boost it has had in a long time. "Satyamev Jayate," tweeted Ahmed Patel after his win. "This is not just my victory. It is a defeat of the most blatant use of money power, muscle power and abuse of state machinery," he also tweeted, targeting the BJP. Mr Patel is political secretary to Congress president Sonia Gandhi and his win on Tuesday in a face-off with the BJP's master strategist Amit Shah is a big shot in the arm of the opposition party ahead of assembly elections later this year in Gujarat, where it has steadily lost ground to the BJP. Mr Patel won by the skin of his teeth. He needed 44 votes to win and he got 44 in a win aided by the Election Commission holding the votes of two Congress rebels invalid for showing their ballot papers to the BJP's election agent. BJP's Amit Shah and Smriti Irani got 46 votes each. The Election Commission order, delivered close to midnight, reduced the strength of the house to 174, which meant that each candidate needed 44 votes to win a Rajya Sabha seat, instead of 45, a target that was seeming increasingly impossible for Ahmed Patel to get amid cross voting and defections in his party. Counting of votes was delayed by over six hours because the Congress petitioned the Election Commission to demand that the two rebel legislators be disqualified. Senior BJP leaders including several union ministers, too approached the Election Commission to counter the Congress's objections, both sides sending multiple teams to the poll panel's Delhi office on Tuesday evening. Counting began around midnight, but was held up again for some time as the BJP raised some objections. Results were declared close to 2 am, sending Congress workers into frenzied celebrations. Amit Shah and Smriti Irani were sure to win given the BJP's big numbers in the Gujarat assembly, whose members vote for the Rajya Sabha election. The party also fielded a third candidate to make challenge Ahmed Patel for the third seat. Ahead of the election, the Congress saw six legislators resign in a rebellion allegedly designed by veteran politician Shankarsinh Vaghela, who too exited the party two weeks ago after he was sidelined. Three joined the BJP, one of them Balwantsinh Rajput the candidate who lost to Ahmed Patel today. Mr Patel was counting on 44 of the Congress' 51 MLAs to support him. One of the 44 voted against him, so he had 43 votes from his party. It is not known yet who else voted for Ahmed Patel - he was counting on Chhotubhai Vasava, the lone Janata Dal (United) legislator, and one of two MLAs from Sharad Pawar's Nationalist Congress Party (NCP) to vote for him. Less than an hour into voting on Tuesday morning, Shankersinh Vagehla had called the election, declaring Ahmed Patel defeated. Mr Vaghela said Mr Patel would "not even win 40 votes" and confirmed he had voted against the Congressman. At least six more Vaghela loyalists still with the Congress - including the two that the party disqualified - are believed to have voted for the BJP.